Consider a set of electric strings and a set of acoustic strings. If their gauge are the same, would the electric ones in general induce less tension than the acoustic ones? Moreover, if the acoustic ones are nickel wound, say John Pearse nickel wound, would the answer to the above question change? I tried to find out some relevant information online; you know why I ask here :). Thank you for your time. The answer is that nickel wound strings (found on electric sets and John Pearse Nickle Wound Acoustic sets) of a given gauge (diameter) will have less overall mass than an equivalent gauge "Phosphor Bronze" or "80/20 Bronze" and therefore tune to a given pitch at slightly lower tension (assuming equal scale length). See comparison chart at end of this answer. Let's talk a little about electric string tension vs. acoustic string tension and the reason behind the prevalence of nickel wound strings on an electric guitar. An acoustic guitar depends on the vibration of the strings to amplify the sound board and produce audible sound. The heavier the gauge and tighter the tension, the more vibration the strings can produce to vibrate the top (soundboard) and stronger vibrations produce more volume than weak vibrations. Technically what happens on an acoustic guitar is that the strings vibrate at a given frequency depending on tuning and fretting. Those vibrating strings in turn vibrate the saddle they sit atop which sits atop the bridge which is fastened to the top. In simplistic terms - the strings vibrate the saddle which vibrates the bridge and top which then acts in a manner similar to a speaker cone and produces the audible sound we hear at the frequency established by the strings. Electric guitars rely on magnetic pickups to translate the vibrating string to an electrical signal which eventually feeds into an amplifier through the electronic circuitry - which translates into a vibration of the speaker through the coil and magnet and we hear the sound emanating from the amplifier's speaker. The electronics involved permit the volume to be controlled by volume knobs on both the guitar and the amplifier. Since electric guitars rely on the amplifier to provide the volume, the gauge of string is less important to volume (just turn it up for lighter strings) and electric guitars can use extremely light strings. The lighter strings allow for easier bending and that fact contributed to the evolution of modern electric guitar styles that use bending of notes to great effect. Nickel strings are magnetic - meaning they respond well to the magnetic pickups in an electric guitar, whereas the windings on Phosphor Bronze or 80/20 Bronze acoustic strings do not respond well at all to magnetic pickups ("non-magnetic" metal). But "bronze" wound strings tend to sound brighter on an acoustic and most players prefer the sound of "bronze" wound acoustic strings over "nickel" wound. There are a few players who like the mellower sound of "nickel" wound on some acoustic guitars which is why John Pearse sells "Nickel Wound Acoustic" strings. Most electric string sets being much lighter than common acoustic sets, will use a plain steel string on the G string. The reason for this is that to get the light gauge needed to balance the tension in a light or super light electric set in the G string, the core around which the windings are wound would have to be so thin the string would constantly be breaking. The tensile strength of the string is in the core itself and the windings provide only mass (no strength). This is why on acoustic sets with a wound g string, the g string is the weakest string. The core (where the tensile strength is) is thinner on a wound G string than on the high e string. But you can get electric sets with wound G strings. They are usually found in what most string companies call a "medium" or "heavy" set. In fact some string sets are sold with both a wound and plain steel G string so the player can use the one they prefer. So that brings us back to the question which I answered in the opening paragraph. But let me prove what I said. The amount of tension required on a given string to cause it to vibrate at a given frequency is determined by the mass of the string and the scale length. If we keep the scale length constant (same guitar) then the variable will be the mass. The mass is a factor of the weight per x length of string - usually expressed as a unit weight in pounds per linear inch (lb/in). The greater the mass (unit weight per linear x) the more tension required to produce a given pitch frequency. 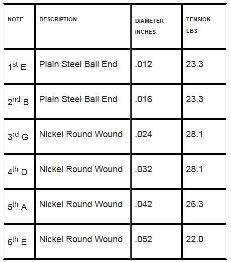 Since the windings used in "nickel" wound strings are made of a material that is lighter in weight than that used in "bronze" wound strings, the mass (unit weight per linear inch) is less - and therefore requires less tension to tune to a given pitch. Of course there are other factors which can affect the mass such as platings on the core, whether it is flat wound or round wound, etc. 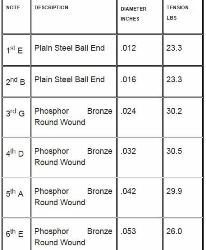 But this discussion is limited to "nickel" wound vs. "bronze" wound of the same gauge and same scale length. As an example of the difference in tension - below I compare two sets of almost the same gauge D'Addario strings using manufacture's reported tensions (charts from JustStrings.com). One is an acoustic set of "12s" in "Phosphor Bronze" and the other is an electric set of "12s" with "nickel" windings. Both sets are "round wound". The plain steel strings are identical in mass so there is no difference in tension. All of the wound strings except the low E are of equal diameter. The comparison is not valid on the 6th strings due to a difference in diameter - but you can see how the other equal gauge strings compare. Tension ratings shown are based on standard tuning. As near as dammit. The difference will be the third (G) string. Generally on an electric set it's plain, but wound on an acoustic set. You probably wouldn't want the plain on an acoustic, although that's what my acoustics usually have - full electric sets. Slightly thinner, but that means less tension. The scale length will be a factor; for a given gauge, the longer the string, the more tension will be required to tune it to the same pitch. The difference between strings of the same gauge will be due to their weight or mass per unit length. This gauge comparison is only valid for like strings -- that is, wound vs. wound, or unwound vs. unwound. A wound string of a given gauge would be very different from an unwound (solid) string of the same gauge.